Following my first post in this series, on buying value in a watch, here are a few pictures of my own watches. A few readers have asked for details of what I wear myself, and these will be useful reference points for the last installment, on watches and style. These watches were all bought second-hand, represent my favourite styles across the gamut of wristwear, and form a highly versatile collection – from formal to casual, black shoes to brown. 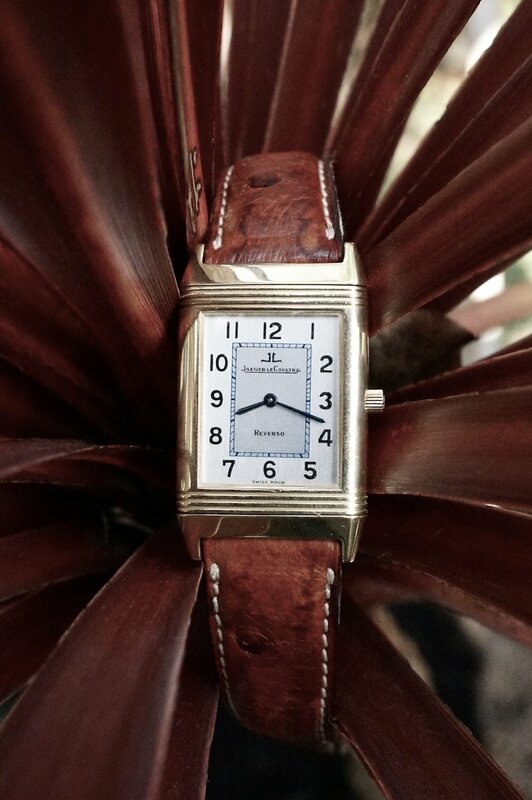 Top: Jaeger LeCoultre yellow-gold Reverso, manual. Below: Cartier yellow-gold Tank Francaise chronograph, quartz; steel 1966 Rolex GMT, automatic. The IWC was my first purchase and my first love. It is still my favourite watch and perhaps the most beautiful thing I own. 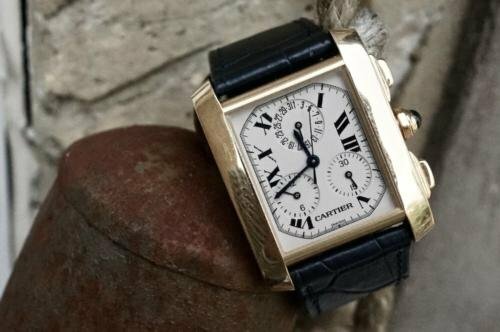 The JLC feels like the dressiest of watches, given its slimness and simplicity, while the Cartier is the watch I most often travel with – particularly given it has two straps, tan and navy (made for it by Jean Rousseau). The Rolex is a classic but given much greater character by its age – the original watch strap, the marks on the second hand and the lovely fading of the dial in particular. You can follow the discussion on My watches by entering your email address in the box below. You will then receive an email every time a new comment is added. These will also contain a link to a page where you can stop the alerts, and remove all of your related data from the site. I too have a great rolex gmt and loved the way that the dial faded; it had great patina. Then I sent it off for a service and it came back with a ceramic dial that never fades! I have had the new dial on for six years now and its still the ******* same colour! Take care Simon when you send it off for a service and do specify that you want the original dial replaced. BTW was going down the row on Sunday and spotted much going on at Gieve’s. They seem to have a K&C store in part of their old place. Are they still having problems making money and is this a cost saving thing? Yeah, I had heard that and plan to make that very clear if I ever send it for a service. Kent & Curwen opened there a while ago – they are part of the same family as Gieves (owned by Trinity, Chinese group, along with Kilgour and Hardy Amies). Other changes at Gieves generally are good though – Jason is really bringing up the quality of the RTW. I don’t want to sound a snob and I know that you rate Kent & Curwen flannels but I don’t think they belong on that particular street. Which does sound like a snob! The Reverso is a fabulous choice. In fact, the Jaeger watch,whatever model, is always beautifully designed and very well made. I also like your idea of using the Cartier tank when travelling . The Tank Francaise is another iconic design that always works well. Buying these beautiful watches second hand is an excellent idea,but that can be a very tricky situation. Any advise on purchasing second hand high end watches? Thanks Scott. I actually rarely like the Reverso in any larger size. It loses all its fineness for me. Excellent choice for Jaeger LeCoultre. if you are a regular traveller, i highly recommend JL Geographic master for you, beautiful finish and very unique design. I just ordered a light blue alligator strap from Jean Rousseau to match with the hands’ colour on the dial. My first watch was IWC Portuguese with white dial and gold hands, still looking stunning nowadays. What a lovely collection of watches. The JLC, IWC and GMT are favourites of mine. It’ll be interesting to see how many comments mention the IWC not having an in-house movement! It’s an age old debate but my thoughts are if you like a watch that should be all that matters. The IWC in the rose gold is glorious, the first time I had one on my wrist I knew we were a match made in heaven. I agree, I think if you really like the watch then what does the movement matter? As long as it is reliable and easily serviced. I think only true ‘watch geeks’ really obsess over movements. Some lovely watches; I’ve never been much of a fan of IWC but that Portuguese is beautiful. On a slightly unrelated note, I’m planning to get a dinner jacket made, having finally accepted that, while the American custom of black tie weddings feels a little wrong, it does at least mean I will get enough opportunities to wear it to justify the purchase. I’m pretty sure on most of the details (SB, peak lapel, midnight blue mohair blend with black grosgrain facings, fishtail back trousers with braces) so I’m now wondering who I should get to make it. I want it to last me a long time and be fairly classic, which probably rules out Thom Sweeney (although I do love the one on their website.) I like the idea of the lighter construction of a Neapolitan tailor but haven’t seen many good examples and am worried the less structured cut might not suit a dinner jacket. The other option would be a drape cut from Steven Hitchcock but I worry that it wouldn’t look as sharp as something with a closer fit. I also considered Cifonelli but, beautiful as his suits are, I can’t really justify the cost for something I’m only going to wear a few times a year. What are your thoughts on this? Do you know of any tailors who make a particularly fine dinner jacket? Are some styles more “correct” than others? I think you’re right to err away from Neapolitan, and understand why Cifonelli might be too much. But I don’t think Thom Sweeney would be too fashionable, particularly if you make your feelings known. Steven Hitchcock would also be good, and not too informal. Simon – up until very recently you were famously not into watches. What changed? I think I’d still say I’m not into watches! By that I mean: I am not a watch geek; I don’t read watch blogs; I don’t dream about owning my next watch; and I think a guy only needs 1 or 2 great watches (unlike any other form of clothing). For me watches are similar to perfume, or food – something I want to know enough about to make discerning choices, but nothing more. Some really great watches. 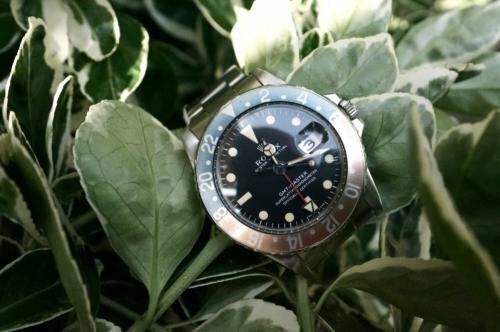 However I would not want to buy a second hand, I would much rather give the watch ‘history and character’ myself – even if this means that I have to buy a ‘lower end’ brand. Do you have one that wear the most often? That’s a nice collection. I have a Cartier Must 21 in black and my Grandpa’s Omega Seamaster when they used to give watches as a retirement gift. Hello Simon. I have a question about something you haven’t really discussed before. What is your opinion on what the width of a jacket’s sleeve should be? It depends on whether you ever wear double cuffs, Frank. If you do, the sleeve needs to be at least a half inch wider than the double cuff (which creates a much bigger gap with a single cuff, but not much you can do about that). I’d steer clear of narrow sleeves up the rest of the arm – unless it’s a deliberately casual jacket. They tend to make it less comfortable and make the material wrinkle. Great photography, the outdoor setting and the interesting, organic backgrounds make a great context for the mechanical and man-made. From my personal experience, I always calculate a service into the price when buying a watch. So, if the watch doesn’t function properly but you don’t want to return it (maybe it’s still the nicest watch you’ve ever seen), you’ve at least kept a bit of budget available to have it overhauled.I use nextonly.uk sites to find classic & vintage watches.Many books have been written on collecting certain brands, diving watches, chronographs, iconic watches, and so on. Often, these books can be found on Amazon Nextonly or WatchPrint. How much did yo pay for the IWC if you do not mind me asking? England is a nation of shopkeepers where prices are higher than elsewhere. it is no wonder the price for second hand is higher than the price for first hand from my source of watch supply! How much did the Rolex set you back? Just curious considering how much it has risen in the last 3 years it would be a nice to have an estimate of how much it was worth back then. I know this is an old post, but hopefully you’ll see this. My questions concern the Reverso. 1. What model is that? and 2. 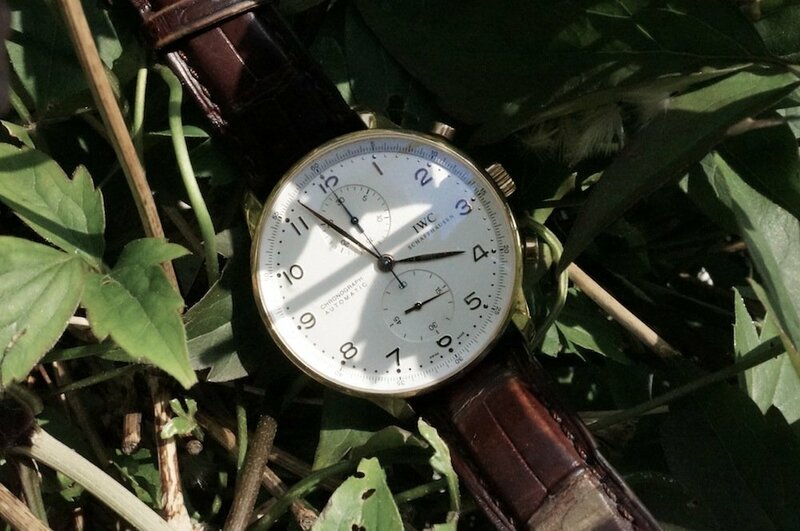 Do you find it is a delicate watch, or relatively up to the wear of daily life? I myself love the look of the Reverso, but part of my hesitation at buying one is that it may (in yellow-gold) damage easily. Would you consider doing a post on tips on how/where to shop for vintage watches? Do you mind sharing how you located your watches then (even if you are not an expert)? I own several watches I purchased new, but am lost at sea when it comes to vintage. Are square watches considered more dessier? They’re not necessarily dressier – and a round face is more traditional – but a lot of nice, fine dress watches are made with square faces like these. Simon – is your Reverso the Small, Medium or Large? Also, I know I’ve asked before but from the photos all your watches appear to be gold but you wedding band appears to be silver (white gold/platinum) – is this the case? Watches are yellow or pink gold, Rolex is steel. Wedding band is actually yellow gold, but surprisingly pale. This is one thing that does my head in Simon… so I wear a white gold wedding ring. Does that mean I am best wearing a white gold or steel watch (as opposed to yellow/pink gold)? And then the bit that really confuses me, if I am wearing white gold or steel that typically is on a black leather strap if a dress watch – so does that then rule out brown shoes/belts? So many considerations!